← MLB Reports “Junior Reporter” Haley Smilow Interviews David Price! This interview was at Miller Park. Home of the Brewers, the sausage race and the 1st place team in the Majors currently. RICKIE: Miami because I was born in Florida and my family is there. HALEY: What do you think of the tailgating at Miller Park? RICKIE: It is absolutely nuts and I appreciate the fans passion. HALEY: Have you ever been a part of it? RICKIE: No, they won’t let me ! HALEY: Which racing sausage is your favorite? What is your favorite sausage to eat? RICKIE: Chorizo is the man and also my favorite to eat. HALEY: Have you ever gone down Bernie’s slide? RICKIE: No but my wife has. I am scared too! HALEY: Do you have a favorite restaurant in Milwaukee? RICKIE: Carnevor, I love steak. HALEY: Are you ever in Milwaukee during the winter and how do you deal w/ the cold? RICKIE: No, just for Winter Fest to see the fans and I stay inside as much as possible. HALEY: If you were not playing Baseball what else could you see yourself doing? HALEY: Besides being drafted as the number two pick, and winning the NCAA Division 1 batting title twice and your appearance in the 2011 All Star game what other accomplishments are you most proud of? RICKIE: Wow good question, I would have to say going to the playoffs twice. HALEY: What do you do before/after games when you are not in Milwaukee? RICKIE: Get lots of sleep and talk to my wife. RICKIE: I pray before going up to bat. HALEY: What is the best practical joke you have ever seen? RICKIE: It pretty lame but putting eye black under the rim of some ones hat is always funny. HALEY: What other sports do you like besides baseball. RICKIE: I love football and basketball. HALEY: Where does your love of baseball come from? RICKIE: All parts and work hard and focus. HALEY: Who are some of your peers that got game? RICKIE: You stumped me, but I am going to say my brother Jemile. HALEY: What do you respect most about your brother? RICKIE: His hard work and dedication. HALEY: What about his game? RICKIE: That he is a switch hitter. I am envious that I can’t and he is very fast. 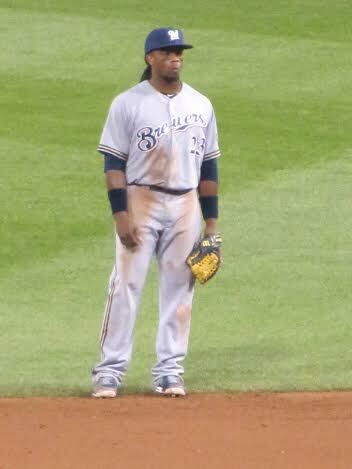 HALEY: Who would be on Rickie Weeks All Star Team? RICKIE: All nine players? Ok how about Prince Fielder, Jemile and the rest of the Brewers. RICKIE: 42, I am a big history buff and Jackie was a big influence of mine. RICKIE: Stick to your dreams and the sky’s the limit. 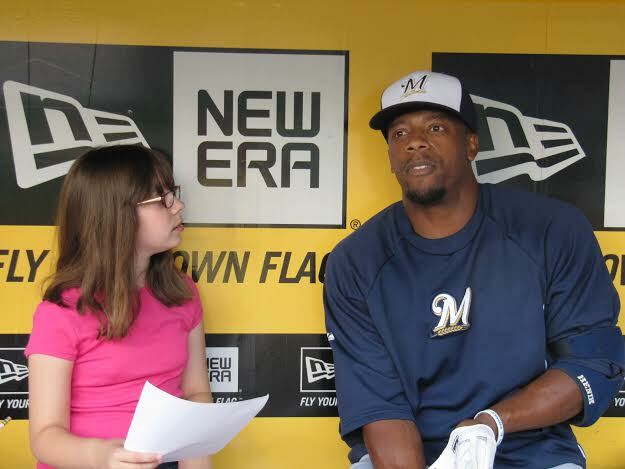 A big thank-you goes out to Our ‘Junior Reporter’ Haley Smilow for asking great questions into this interview and representing the MLB Reports. Posted on April 28, 2014, in Interviews with MLB Stars and tagged @Smilow on twitter, jackie robinson, jemile weeks, miller park, milwaukee, milwaukee brewers, NL Central, prince fielder, rickie weeks, sausage races. Bookmark the permalink. 1 Comment.